We recently took issue with Brøderbund's video game controller that required no physical contact, the U-Force. This forgettable, flaky Nintendo Entertainment System controller, almost universally despised, has been mastered by one man, who uses his U-Force with rare mastery. "We've had a U-Force sitting around my house since the mid 90s, which we bought cheap at Funcoland at the end of the NES era," Karen writes to Kotaku. "A few years back, however, my brother, Joe, decided to dedicate himself to figuring out how the thing worked and how to use it. There are multiple configurations, and the key is to find the right one for the game you're trying to play." Joe, Karen says, had "cracked the code" of the U-Force, daring to play some of the NES's most challenging games on the theremin of video game controllers. "I remember watching him when he was still in the experimental stages of figuring out how to play, and it reminded me of some weird cross between playing an instrument and interpretive dance," Karen continues. "He's also a musician, so I guess that's fitting." 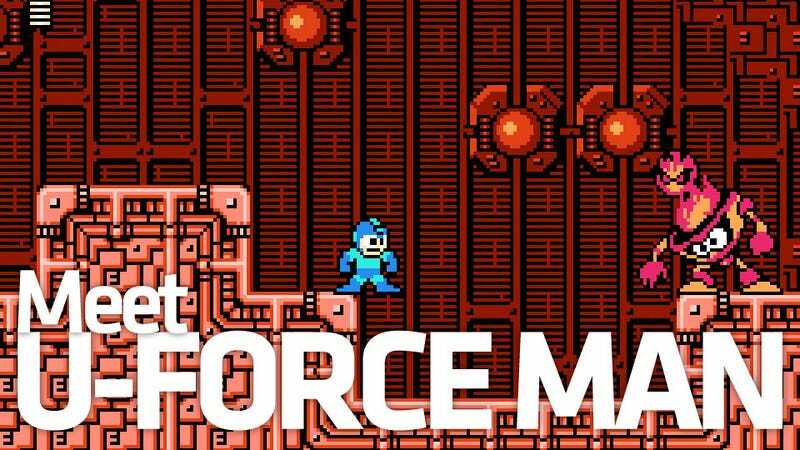 Joe, a Mega Man fan, moved on from playing only NES games by waving at the air and started playing Super Nintendo and Nintendo 64 games with the U-Force, via emulators. You can see some of Joe's expert U-Force usage in the gallery of videos above or you can visit his YouTube channel to see an even longer list. Joe employs the U-Force to tackle world 1-1 of Super Mario Bros. 3. Joe takes on Flash Man in Mega Man 2, one of the more challenging platformers for the Nintendo Entertainment System. Mr. McKenna, U-Force user extraordinaire, beats stages 1-1 and 1-2 with a perfect run and no touching. See tetrimino placement finesse, U-Force style, as Joe plays some Tetris with the air. Joe runs the first race of Super Mario Kart's Mushroom Cup, Mario Circuit 1, and (SPOILER) comes in first place. An impressive display of a game designed for an analog controller played with an infrared NES device. Joe beats level 1 "Bob-omb Battlefield", Star 1, "Big Bob-omb on the Summit" from Super Mario 64.